I've been known to spend exorbitant amounts of cash on toys for my kids, particularly if I think it will be educational. That being said, my seven year old is obsessed with Legos. He has quite an aptitude for them as well. We have purchased many of the little sets and have now graduated to the larger ones as the previously mentioned take about 5 min. for him to put together. For the most part, Legos are grossly overpriced, everyone knows this. You can spend a small fortune on the things but I do think they are great for creativity, following directions, and methodically working on a project. So, I drop the cash like a good Dad should and my kid goes nuts. We have purchased both of the Pirates of the Caribbean ships and he has put them together without help, which is no small feat. He spent hours and hours over several days working on them and when he was done, had some impressive ships. I was also quite proud of the fact that he figured out how to assemble them and follow the schematics on his own. He played with them non-stop for many more weeks after they were built, and they are now in the normal rotation of other toys. Mostly though, they just decorate his room like a model. Now I come to my most recent purchase from the Lego world. My son wanted the Lego Hogwarts castle set, yup, the big one, $130 on Amazon.com. I told him that he would have to save up his money, do extra chores, and if he was diligent, it would still take him several months to pull together that kind of scratch. So, we setup a spreadsheet and he went to work. Long story short, he saved, he waited, and with a little help from Dad, he had enough to buy it on May 1st. I ordered it a couple of days early so he would have it right on the 1st as we had planned. When it got here the box looked great, it was massive, and he was psyched. Off he went, working away for hours and hours again, and he again finished it in a couple of days. When he was done, he brought me in to look at his masterpiece and I was a little shocked. The thing is tiny. The box alone infers a massive castle, the price demands a monstrous dwelling, what he ended up with was a tiny shack. If you set this next to the previously built Pirate ships, they dwarf it. He even asked me why it looked so small, I just said that they make it that way so the other Harry Potter sets are scaled properly, but that was a blatant lie. I just didn't want him to be disappointed that he got ripped. To be completely fair, it does have several cool little hidden doors and a spiral staircase that collapses. There are lots of little details that are pretty cool and there are at least eleven of the movie characters in the box, but overall, this was the most disappointing Lego set we have ever purchased, and it was 130 BUCKS! I don't know how Lego prices these, if it is strictly by the number of pieces, or by the pound, but if you send me a monstrous box with a gigantic picture of a castle on the side, you better have a resultant project with some mass. I realize that compared to the other "block" toy manufactures, you have the corner on the market, and I also agree that the quality of the pieces is always good and they fit together well, but good grief, if I have to spend my monthly mortgage payment for a set, make it something that doesn't disappoint a seven year old. Even in his three foot tall world, this thing is tiny. 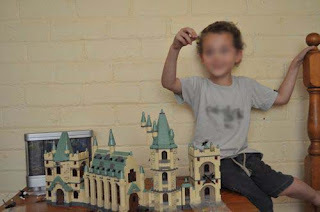 Note: I found this picture on the internet of a (roughly) 3 year old sitting next to the complete castle. 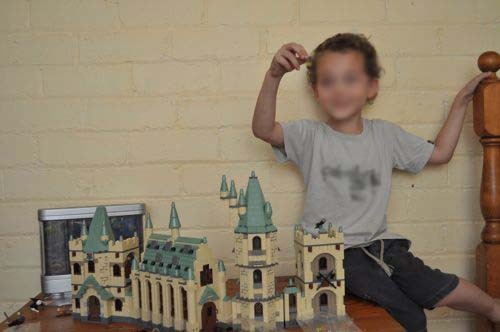 I blurred his/her face to protect the innocent but it gives an idea of the underwhelming size of the finished product.